Are you still looking for a special gift? Do you already have a house in Florida? But surely no land on the moon, Mercury or the sun? A Wonderful View - With us you get ownership deeds for planet lots. These documents are only intended for decoration purposes only. Are you looking for a romantic gift for your partner? Get Him a Star from the Sky - With Our 100 Acre Moon Land. After your Payment we send your pdf documents per E-Mail. How can you acquire real estate on a planet? 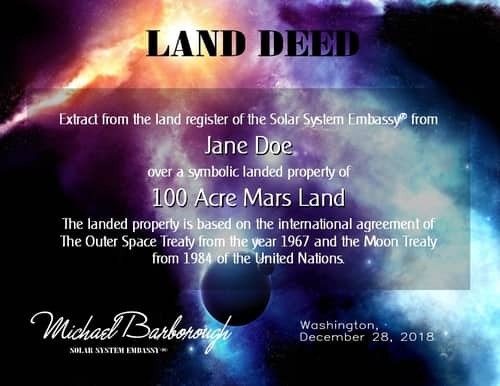 Through the United Nations "Outer Space Treaty" of 1967, it is possible to officially and legally own land on the moons or planets. The property is registered in the Land Registry of Solar System Embassy®. How did the trade in lunar properties even begin? Most providers in this sector claim to be the "legitimate" owner of the moon. The "inventor" of this idea was probably Dennis Hope from the USA. This gentleman founded a company and claimed that he was the owner of the moon — but he is not entitled to do so. 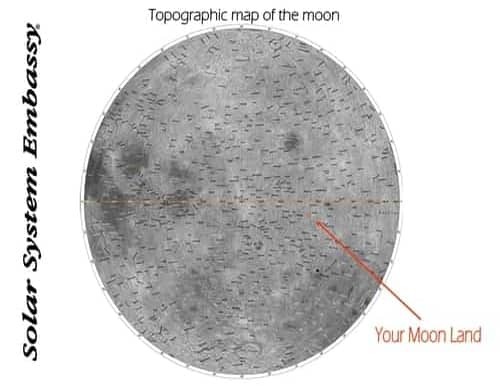 The moon can not belong to anyone... Mr. Hope and many "moonbrokers" claim that Mr. Hope has registered the Moon and all the other planets of our solar system in the San Francisco Land Registry. We asked the Land Registry Office! If Mr. Hope can sell a moon property, then everyone else can. Dennis Hope, the company owner, refers to the Outer Space Treaty of 1967 and the Moon Treaty of 1984. These are UN treaties: United Nations Organization (United Nations) - A post-World War II peacekeeping foundation Organization. Fifty states signed the statutes of 1945. The main bodies are the Plenum and the Security Council. The Security Council is intended to uphold world peace and is composed of representatives of the five permanent (China, France, UK, Russia, US) and ten changing states to clarify the legal side of space affairs and all related issues. Hope refers to a legal loophole because the treaties expressly prohibit individuals from having property on the moon. That is forbidden only for nations, but not for companies. Moon und Outer Space Treaty? Article 2 of the Outer Space Treaty of 1967 states that nations are not entitled to claim possession in space, on the moon or other celestial bodies. Individuals or organizations are not mentioned and therefore are not part of the contract. The UN sought to remedy this deficiency in Article 11 of the Moon Treaty, which entered into force in 1984. (Neither the surface ... of the moon, nor ..., shall be property of any state, international, intergovernmental or non-governmental organization, national organization or non-governmental entity or of any natural person.) However, this contract ratified by only a few Member States and therefore has no real significance. However, it is already stated in the Outer Space Treaty that the moon is a common good of humanity (... .and shall be the province of all mankind). For that reason alone, Hope's ownership claims to the "common good of humanity" would be void. And yet: The Moon Treaty was signed only by 10 of the 185 UN member states. All major space nations are still standing today. Reason is the article 11: It determines that the contracting parties should agree on the use of the moon and share any proceeds with other countries. Officially, it says in the US that one wants to wait for a signature on how public opinion is developing on this issue. A "Venus Treaty" or "Mars Treaty" does not exist. Because of the great distance to Earth, this did not seem necessary to those responsible. Here the loophole is still officially available. In addition, the alleged property rights, to which Hope refers, were awarded by the Land Registry in San Francisco. The granting of real estate is linked to the laws of the country in which it is located (here a law from the pioneer period: who claims a piece of land for himself, he must register in the land registry - then contradicts nobody for eight years, it belongs to Applicant). The same applies to the competent jurisdiction: jurisdiction is the generic term for the organization and activity of the judiciary. The ordinary jurisdiction in Germany includes civil and criminal matters as well as voluntary jurisdiction. Furthermore, there are the constitutional, administrative, financial, labor, social, patent, disciplinary, honorary and military service jurisdiction. 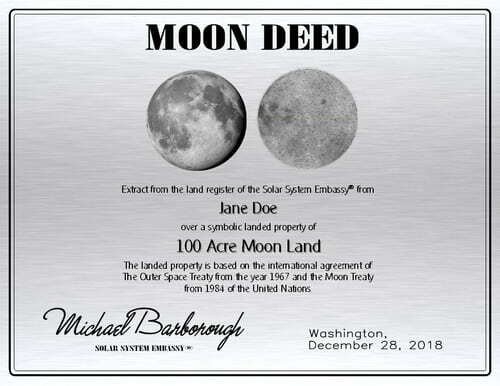 Hopes alleged rights are therefore unenforceable, since the moon belongs to no nation and an American land registry can only grant property that is also on American territory. However, the US has explicitly confirmed on its moon landing that they do not claim any territorial claim to the moon under the Outer Space Treaty. It is not forbidden Dennis Hope to sell moon plots. The sale of lunar properties can be done by any person, there are no laws in this regard. However, it is anticompetitive to claim that Hope alone is allowed to sell lunar properties. With this statement Lunar Embassy violates the competition law. Owning a moon property is a very nice thing. But please take this information as a thought-provoking thought about whether such a beautiful and interesting thing really can be commercialized in this way ... If even dreams and romance are sold under the guise of lies we may be better off on the moon , We wish you a lot of fun with your decorative certificate! On July 16, 1969 started after 10 manned and unmanned test flights again from a Saturn V rocket from the Cape Kennedy spaceport. 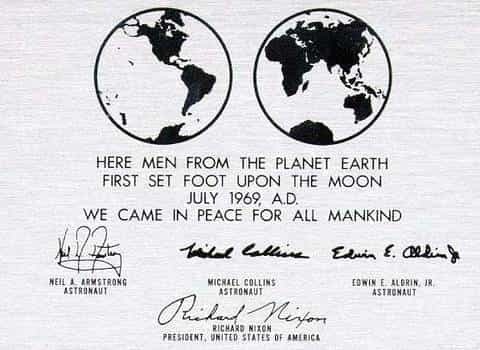 On board are the astronauts Neil A. Armstrong, Michael Collins and Edwin E. Aldrin. After a four-day flight, Apollo 11 reaches the moon as planned and circles it. Then the lunar module Eagle is separated from the command module and begins a deceleration braked by the thrusters. Michael Collins remains in the lunar orbit while Neil Armstrong and Edwin Aldrin slowly approach the surface. During the descent, some malfunctions occur in the on-board computer of the lunar module and it comes from their course. Recently, Neil Armstrong takes over manual control. 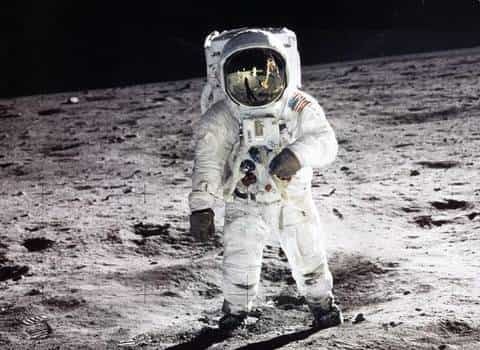 When the vehicle finally lands in the "Mare Tranquillitatis", Armstrong confirms this with the words: "Tranquility Base here, the Eagle has landed" — the eagle has landed. On Earth, 400,000 km away, more than half a billion people watch the event on television. After all, the Apollo transmission is one of the first live broadcasts ever. Two hours after landing on the moon, Neil Armstrong begins to climb down the lunar module ladder in the spacesuit. He comments his first step on the moon with the words "One small step for one man, one giant leap for mankind" — A small step for a man, but a great one for humanity. Aldrin and Armstrong set up experiments at their landing site, set up the American flag and collect 22 kilograms of lunar rock. After 152 minutes, the astronauts return to the lander and prepare for the start of the command module. On July 21, 10969, Eagle takes off from the moon and docks on the mother ship in lunar orbit. Then the return flight to Earth begins. On July 24, 1969, the Apollo reentry capsule lands southwest of Hawaii in the Pacific. She is being rescued by a US Navy ship. 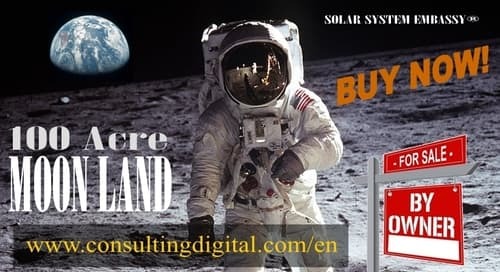 More than Moon Land: Sun Land, Jupiter Land, Mars Land, Merkur Land, Neptune Land, Pluto Land, Saturn Land, Sun Land, Uranus Land and Venus Land. With us you get ownership deeds for planet lots.